The most romantic city in the world for your wedding day ! Still wondering why Paris is the most romantic capital in the world ? Well, wandering around this ancient city stretched on either sides of the Seine river with its many gothic churches and impressive royal monuments spread around, you can but feel its amorous atmosphere. Add a touch of lovely French accent in the air, an artistic ambiance and cafes at every corners of any streets and you’ll get Paris, a perfect destination for your vow celebration! The 2 most iconic landmarks of this city are of course the Eiffel Tour and Notre-Dame. Both offer stunning views of the capital and will provide a superb scenery for your love ceremony. You can know more about our wedding celebrations at the Eiffel Tower on our dedicated page. Our symbolic wedding vows in Notre-Dame cathedral are also a specific package. 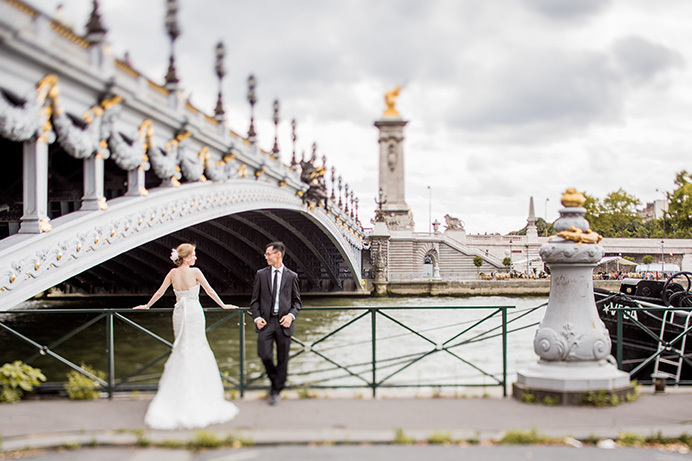 Paris offers so much more wonders for the eyes that you could also chose other lovely locations for your proposal, destination wedding, elopement ceremony or vow renewal. For exemple, you can have your ceremony in the Chapelle Expiatoire. Wishing to stay in the city centre of Paris? Then you might love the Palais Royal, this impressive royal building facing directly the Louvre museum. This “village in the city” is a lovely site to host this special ceremony. This couple had an amazing symbolic marriage ceremony there. Willing to take a little trip outside Paris in what used to be the capital of France kingdom? Versailles sumptuous castle and gardens are waiting for you. Here is a video of a sweet love celebrations we had in Versailles. Fond of nature-oriented and leafy spots? Then the majestic Luxembourg gardens will take your breath away. Right in the centre of the Latin quarter, bordering St Germain des Près, these gardens were designed by the Queen Marie de Medici, inspired by the Boboli gardens of Florence. An oasis of greenery, this peaceful and joyful site will make a lovely setting for your photographs and videos on that special day. Have a look at a beautiful ceremony we celebrated in the Luxembourg gardens in this video. Another great location that has created lovely ceremonies was the Buttes-Chaumont park, one of the biggest green area of the capital. Its wide leafy spaces offer an impressive view over Paris. Have a look at a really nice “Parisian” ceremony we had at the Buttes Chaumont. Right above the Seine river, the Vert-Galant park offers a stunning setting for your ceremony. Located at the tip of the Ile de la Cité, you will love its mixture of greenery, water and architecture. Here is a moving couple telling us how their symbolic wedding ceremony in Paris went for them. A little away from the hustle of the city centre, the flowery Bagatelle gardens are a wonder you will enjoy. Majestic roses, peonies and peacocks for a setting in this fairy-tale like botanic garden! To have a look at a love ceremony in the Bagatelle gardens in Paris, here is a video for you. Would you wish to hire a photographer, a video producer, a makeup and hair stylist, have flowers or even a vintage car, we are here to meet your needs and desires. With over 10 years experience, we have been able to select great local professionals for you on that very special day.